Independent Blinds and Awnings also provide advice on insect repellent and supply & install fly screens and security screens and doors. 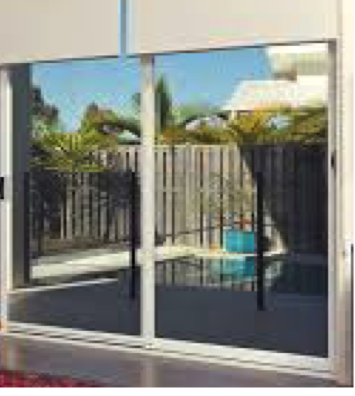 Door and window security screens present a visual deterrent as well as effective protection against uninvited guests. Finding the right balance between appearance and performance versus individual budget is not always easy. You need to be able to see outside, keep the cool breeze flowing, shut out all insects and don’t let potential intruders in. All our products are custom made to enhance the design of your home. Our security doors and screens are designed with solid stainless steel or aluminium frames/panels and can be fitted to any size window or door. The solid metal and steel mesh screens last for decades so please don’t settle for some flimsy frame that just keeps out insects and only lasts a short time. You can add value and security to your home with the traditional Diamond Grille doors & window screens. 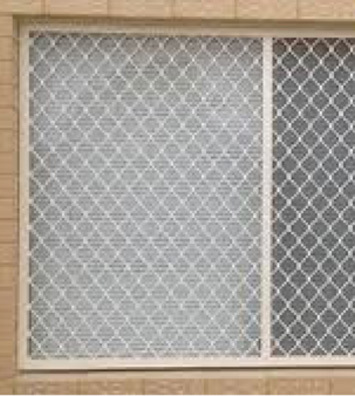 Diamond Security Grilles have a 7mm strand thickness that meet the requirements of the Australian Security Door Standard AS5039. To obtain maximum benefit from Security Grilles all doors made incorporating these grilles should also be manufactured to comply with AS5039 and installed to comply with AS5040. All Diamond Grille Doors are available with the option of One Way Mesh, ideal if added privacy is required. One Way Mesh allows you to see out through your door at the same time as reducing the visibility into your house from the outside. Perforated Aluminium screens are the modern replacement for traditional diamond grilles and a less expensive alternative to the premium Stainless Steel Mesh. 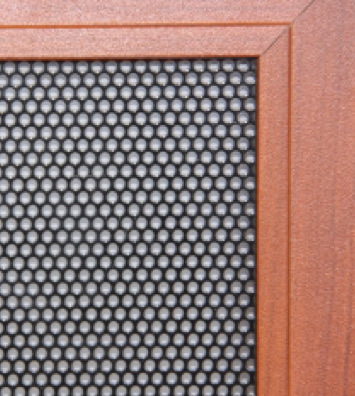 Our perforated aluminium panels are extremely durable, corrosion resistant and energy smart. Our Perforated Aluminium screens surpass the Australian Standard and look very similar to stainless steel screens but are not as clear to look through as the sheet is twice as thick to meet the Australian Standard. It is priced in between diamond grill screens and stainless steel screens. Stainless Steel Mesh is our state-of-the-art security screen that looks like a fly screen, but is actually high tensile (0.8mm) 316 grade stainless steel expertly woven into a fine mesh. T316 is selected for its superb strength, durability and resistance to corrosion, making it perfect for all Australian conditions. The strength and the composition of the mesh offers the comfort of fresh air flowing through your home allowing you to enjoy clear & unobstructed outdoor views. The 316 Grade mesh is assembled using a unique, patented pressure process that eliminates the need for screws, rivets, pins or snap ins. The process ensures that no metal surfaces come into contact with each other, eliminating the possibility of corrosion. Be assured, these are quality screens tested to the highest Australian standards.